PRODUCT: C4 Cylindrical Portal SECTOR: Budget Gyms CLIENT: Pure Gym LOCATION: UK Nationwide Since opening its first gym in 2009, Pure Gym has rapidly grown into the UK’s leading gym operator by using a simple low cost scalable business model. In doing so, Pure Gym has been able to achieve a significant cost advantage which supports a low cost membership offering and has attracted more than 820,000 members at over 170 sites – making it the UK’s largest gym operator. 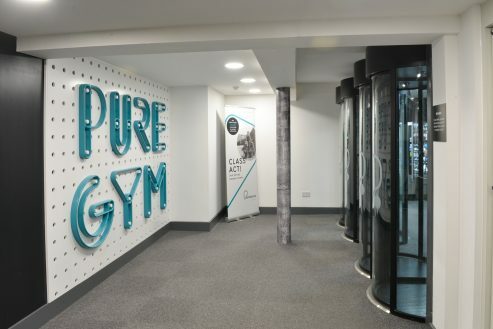 As part of its growth plan, Pure Gym has closely examined its development strategy with a specific focus on driving efficiencies, keeping operating costs to a minimum whilst maintaining the highest quality and safety standards. 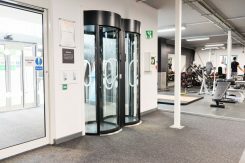 This approach has led to the provision of 24/7 gym access for members, providing flexibility for customers and from a commercial perspective, optimising the use of all sites at all times. In any business, providing 24/7 access brings with it security and safety considerations. 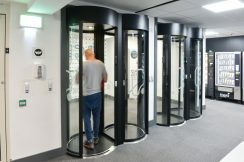 However, in a bid to keep operating costs down, Pure Gym looked to address these using the very best in secure access technology and turned to Meesons for a solution. 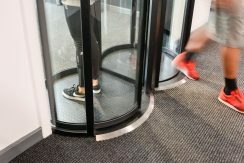 Assessing Pure Gym’s operating environment and security needs, Meesons specified the C4 cylindrical portal. 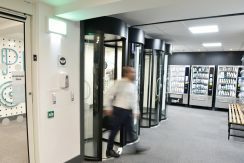 As a double entry system, the C4 is ideal for high traffic areas, enabling the efficient entry and exit of members whilst maintaining secure and safe throughput. Since 2011, Meesons has supplied and installed over 200 C4 cylindrical portals at Pure Gym sites UK-wide. 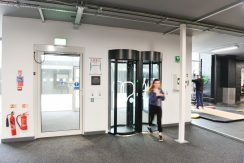 The solution has become the standard specification for all Pure Gym facilities based on a number of commercial and operational benefits it provides. With an intuitive user interface, the C4 can be easily operated by the public without any need for supervision by reception staff. In doing so, it helps Pure Gym to keep its gyms operational yet secure – and operating costs to a minimum. Open 24/7 the C4’s low power consumption coupled with its interlock door design provides a green low energy solution. While all sites are fully serviced and supported by Meesons, the impressive reliability and independent unit operation of the C4 double entrance system means that downtime is virtually unheard of which provides an excellent customer experience and protects Pure Gym’s revenue. Moreover, as Pure Gym offers members the flexibility of no fixed contracts, the C4 makes it quick and easy for Pure Gym to control access to only those who are currently paid members. Finally, when planning the development of new sites, Pure Gym needs to make the absolute best use of space to ensure the maximum return on investment. 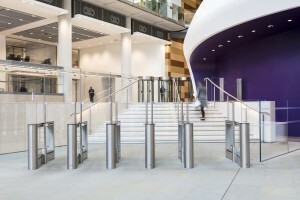 As a space-saving design, the C4 assists this strategy by using a single cylindrical unit for both entrance and exit – as opposed to the two units that might alternatively be used.